Intricately hand-woven Raffia cloths by the Kuba people of the Congo. These woven treasures are a feast for the eyes & an intricate sensation to the touch! Raffia palm fibers are dyed in warm earthy colors derived from plant materials then woven & richly embroidered in beautiful & elaborate geometric designs. These extremely detailed cloths can take up to 1 year to weave. In the Congo their uses vary from status symbols, to doweries, & currency. The longer rectangular pieces that can be up to 15 feet in length are used as wrapped ceremonial skirts. These magnificent textiles on exhibit are highly prized as works of art by museums, collectors & interior designers throughout the world. 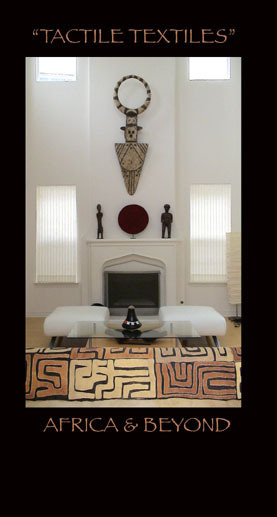 The textiles can be purchased in many forms (plush squares, pillows backed in suede, wall hangings, etc.) for decorating a myriad of spaces - traditional, contemporary & eclectic. For more images, products and information, PLEASE VISIT OUR "TEXTILES" PAGE.